Did you guys see this?? 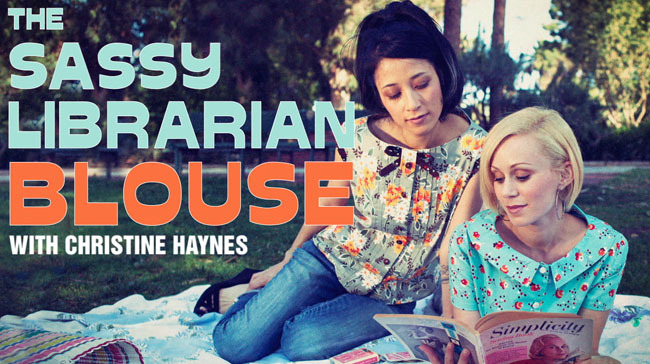 Christine Haynes has a class on Craftsy for making this Sassy Librarian Blouse. I have never taken an online class, but I really want to take this one. I mean, how cute is this top?!?! I can definitely see myself wearing this blouse all the time, it would be perfect for me at work. This version is too cute, my sister would love it. You could even buy the same fabric from Rochelle's work if you want to have the same look. Ok, on to this past weekend. A fellow blogger and friend, Qui, was in town this weekend, so I asked her to go with me to the Seven Sister's Quilt Show in San Luis Obispo. There were so many beautiful quilts on display, it definitely got me inspired. This quilt is by Charline from the Santa Maria Valley Quilt Guild. The color doesn't translate well, but the blocks are made up of blue fabrics, all from Hawaii. I love that the whole quilt is blue and white because the quilting really stands out. My friend Smitty from SLO Quilters made this fun Hawaiian quilt. Look at those colors! One of my favorite booths at the quilt show is Beyond the Reef because everything is Hawaiian. Can you tell that I love Hawaiian stuff? The have the cutest fabric selection and the owner was SO nice. 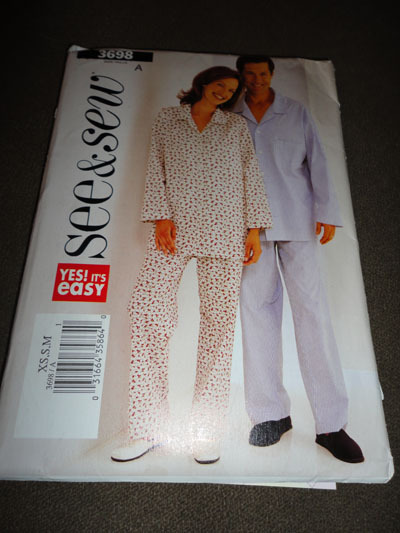 After I bought my fabric she gave me and Qui a pajama pattern, just because. Now I will be ready for the next online pajama party. Check out this gorgeous Featherweight. It's a prize for the yearly Quilt Shop Tour of the Central Coast. I asked about the amazing color and was told that it had been painted with car paint to get that blue. I'm not sure if the pin striping was done with car paint as well, but it's beautiful. Hi there! Natalie from beyond the reef, here....thanks so much for stopping by the booth. It was a fun weekend for us to see all of you, too! Hope to see you in July at International Quilt Festival, Long Beach, or in October at PIQF, Santa Clara. Let's have some more FUN! I want to go to the Long Beach convention, so I will look for you there! Are you going to take the class? It might be fun to get a group of ladies to take the class at the same time and show off our blouses together! I saw that you pinned the blouse class earlier and immediately I was like "Oh hey! I stare at that same fabric all day long!" haha :) It is a WAY cute shirt. The Gone with the Wind quilt is straight up amazing!!! ...and so is the featherweight! I'm dying over the teal and gold combo. Wow! Gosh, that librarian blouse is too cute! I love it! And that Hawaiian quilt is the coolest! I love Hawaiian prints, too-- they're so cheerful and fun! That blouse is really really cute!! I'm glad you got a pic of the blue quilt; I'm still thinking about it :) I think I fell in love, hehe. Thanks for hanging out, it was much fun!! I love the blouse! Please make it :) And now I want to paint my sewing machine and have it pinstriped, that one is rad! I have never taken an online course either. To be honest, I'm kind of hesitant but that top is too too cute! Great post! What a feast for the senses! 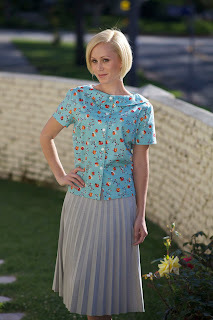 I love that blouse, too, and am thinking about frankenpatterning the Violet blouse for my own version. The quilts are stunning - I love, love the Gone With the Wind one. 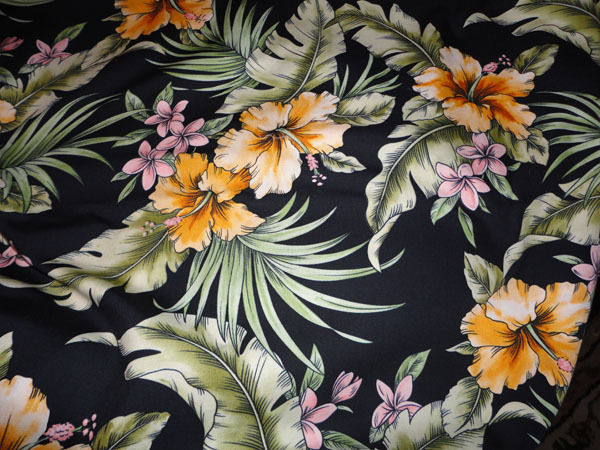 Your Hawaiian fabric? Delectable!!! I love it! I can't wait to see what you make with it. That Featherweight is spectacular. Love the colour! Hi! I just saw this post and wanted to thank you for posting about my class! If anyone wants to take it, now's the time since it's brand new, it's half off! There are already over 550 ladies enrolled in only a week and the finished results are so cute!!!! if anyone has questions, feel free to ask me!